eBay is suffering a major outage Saturday morning that is preventing buyers and sellers from bidding, making purchases, or completing other tasks on the site. Reports are still coming in to Down Detector, such as this one at 6:40 am: "Alot of functionality is not available. I have bids on many items; my bids don't show up. My purchase history is not there." eBay posted a notice last evening (6:05 pm ET on Friday) to report that a problem with its checkout system had been investigated and resolved. "We are aware that some users are currently experiencing intermittent problems with using the website. Our teams are working to address these issues. Our highest priority is our members' trading success. We apologize for any inconvenience this interruption causes. We will share additional information with our community as it becomes available." One reader sent an email to EcommerceBytes overnight: "I was trying to post some items on eBay this evening and after getting one up, the system went down at about 11:00pm (Pacific Time) and is still down at 01:14am. A reader in the UK wrote at 5:40 am ET, "eBay has been down most of the morning." Reports are also coming in to Ecommerce EKG, the first one came in at about 2 am ET. Stay tuned, we'll keep you updated. We have resolved a technical issue that was causing some customers to experience slowness or loading issues when accessing certain parts of the eBay site. This has been fully resolved and we apologize for any inconvenience that it may have caused. However, it downplayed the severity of the issue "some users" - "slowness" - "certain parts of the eBay site." eBay did not tell sellers how they could protect themselves and whether they could cancel auctions, which were unable to receive last-minute bids, without fear of defects and negative feedback ratings. Update 9:00 pm: eBay posted announcements on its main Announcement Board about the outage. The first post at 1:48 pm told users the majority of technical issues had been resolved, and standard protections would apply. In the second post at 4:20 pm, eBay explained the cause of the outage: "From 10:25 PM PT on Friday, November 13, to 6:49 AM PT on Saturday morning, November 14, eBay experienced a network connectivity issue in one of our data centers." And it outlined in detail what actions it would take in an effort to make things right for sellers who were impacted by the issue. Ebay is like a recurring bad nightmare. And they want to add other stuff to the site. HA HA HA HA HA HA Thats so funny. all I see is yammer about the photo uploading not working and then getting fixed. Total and complete incompetence at every level is nothing new at eBay. eBay's IT infrastructure is the worlds most fragile and illustrates managements complete failure to address one of the biggest issues this company faces. I would bet that one of the reasons eBay's search engine is such a hot stinking mess is due to the fact that the newly written search engine does not run as efficiently as it should is due to the fact that the coding on the rest of the site is so antiquated. eBay management lies to members and investors about the frequency and severity of system failures - IF they acknowledge system failures at all. When they are forced to admit system failures, they downplay the severity of those issues so that investors are less likely to be concerned. I had problems seeing my "sold" items for about an hour last night. I sold an item about an hour ago so it appears all is well again. . . Unknown - to answer your question, there are two eBay announcement boards. Just logged in to list. None of the photos are taking. Had one sale early yesterday. eBay if you are paying attention, please fix this. Also when trying to view certain pages I am getting errors! 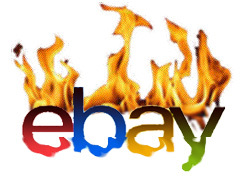 During the outage I was able to get to ebay's home page Wish bigger Deals Fashion etc. so everything "appeared" well. Everything concerning my selling, watch lists etc. showed "page not responding". However, I was able to click through to anything ebay was showing me from that home page - Fashion, Deals, all their "Preferred" Sellers special deals. Ebay had complete control of what they wanted me to see and buy. Could all their manipulating caused the rest of the site with us lowly sellers to go glitchy and lose sales? Is eBay's programming ONLY going to work this holiday season for their big retailers and preferred sellers? Pic Upload is a simple basic thing.. I even have it on my web site... I mean a 12 year old can do this and make it work. But hey, Look at our nifty new log-in page!!!! I can't remember a day in the last year where I didn't encounter at least one ebafia "glitch." Not one day! Most of them are simply very annoying. But some of them are severely interfering with sellers profitability and, by extension, ebafia's profitability. Constant platform instability and the increasing frequency of glitches and outages MUST be corrected. It will only get worse as Wenig introduces his latest ridiculous brainstorms to search. The platform was an absolute mess before Negged Meg Whitman left, and no one has had the cojones to fix it since. OMG, Ina those graphics. They are ALWAYS so GREAT !!!! Getting truly tired of the phrase "We apologize for any inconvenience..."
Stop apologizing and fix the danged problems!! Photos not uploading, potential buyer can't find the item he was watching, it just goes on and on. I can't fool with them today. Spit and duct tape technology. I love the "crash and burn" graphic. Nothing instills the feeling in buyers that their info is secure like a website that constantly goes down. Once again feebay shows that they are their own worst enemy. My goal has been to move all my listings to ecrater by the end of the year and shut down my ebay store. Every time ebay is down, I spend that time moving things to ecrater. I'm ready to shut down my ebay store almost 2 months early, woo-hoo! How can Devin expand his longtail inventory when the site goes belly up constantly? How much longer are the eBay sellers going to put up with this craziness? To mb's point, ecrater never goes down. I don't recall ever having experienced a glitch there either. And no having to refresh listings either. You list and you're done. My gallery pictures weren't loading last night, at least that was what I thought when the gallery picture just said "photo"
But an hour later they were there. I sold 2 items today so eBay is somewhat working. . .
@Ina, there is no link on ebay that brings you do the 'technical system announcements' board. If you don't have that page bookmarked or someone doesn't give it to you on a board, you cannot find it. You can read about it in google books, just can't find it on ebay. I'm still requesting they set up an announcement board for what actually DOES work.